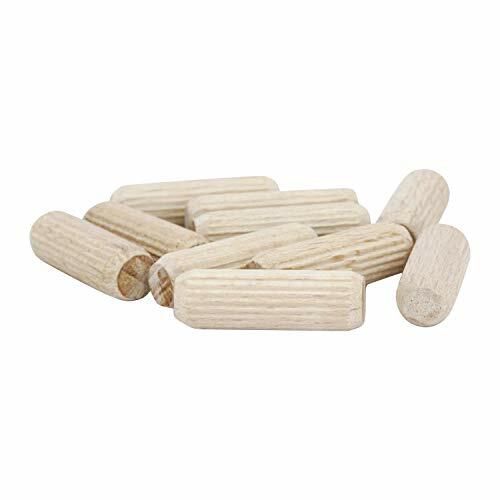 100 Pack 1/2" x 2" Wooden Dowel Pins Wood Kiln Dried Fluted and Beveled, Made of Hardwood in U.S.A.
100 Pack 1/4" x 2" Wooden Dowel Pins Wood Kiln Dried Fluted and Beveled, Made of Hardwood in U.S.A.
100 Pack 3/8" x 2" Wooden Dowel Pins Wood Kiln Dried Fluted and Beveled, made of Hardwood in U.S.A.
200 Pack 3/8" x 1 1/2" Wooden Dowel Pins Wood Kiln Dried Fluted and Beveled, Made of Hardwood in U.S.A.
3/8" x 1 1/2" Fluted Wooden 100 Pack. 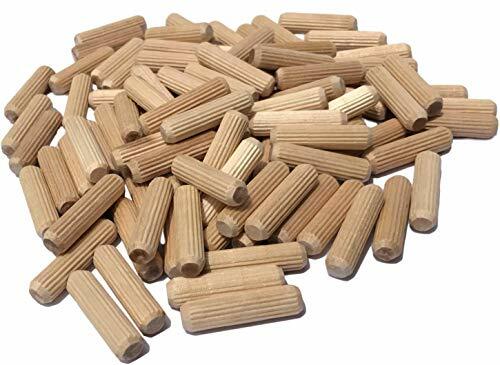 Wood Dowel Pins are Kiln Dried Birch Wood with Flutes which Eliminate Trapped Air for Superior Fastening. Fluted pins also ensure even glue distribution. Made of Natural Hardwood Harvested responsibly to meet FSC standards. Natural Birch wood, Non Food Safe. Beveled Chamfered ends are essential not only making aligning simpler, but crucial in ensuring completion of hand made man made projects. Allows margin of error and compensates if measurements are slightly off. Made of Hardwood This product comes in a clear plastic ziplock sealed bag which eliminates moisture for easy storage and accessibility. DIY practical applications: furniture refurbishing or repairs , shelving, shelf replacement, cabinetry for repurposing cabinets, up-cycling, maintaining chairs, repairs etc... Some arts and crafts applications include: class room projects, party crafts, camp crafts, model building, doll house miniatures, for teachers, students and camp instructors Some education applications: academic tools, teachers supplies for grade school, pre-k pre-school, kindergarten to elementary, middle school to high school. math tools for counting cognitive learning. A great American product. 100% Money back guarantee if you're not completely satisfied. 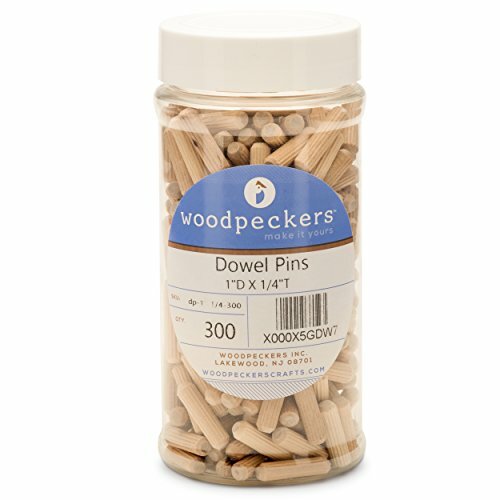 These Dowel Pins are Kiln Dried Birch Wood with Flutes which Eliminate Trapped Air for Superior Fastening. Fluted pins also ensure even glue distribution. Made of Natural Hardwood Harvested responsibly to meet FSC standards. Natural Birch wood, Non Food Safe. Beveled Chamfered ends are essential not only making aligning simpler, but crucial in ensuring completion of hand made man made projects. Allows margin of error and compensates if measurements are slightly off. Made of Hardwood This product comes in a clear plastic ziplock sealed bag which eliminates moisture for easy storage and accessibility. DIY practical applications: furniture refurbishing or repairs , shelving, shelf replacement, cabinetry for repurposing cabinets, chairs etc. Arts and crafts applications include: class room projects, party, camping, model building, doll house miniatures, teachers, students and instructors. Educational applications: academic tools, teachers supplies; math tools for counting cognitive learning. A great American product. 100% Money back guarantee if you're not completely satisfied. 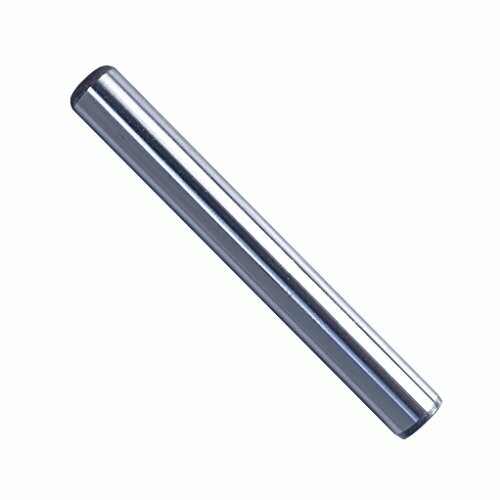 A fluted dowel pin has a series of parallel grooves cut along its length providing channels through which excess glue - that is used to secure the dowel pin in its hole - can escape as the dowel is inserted. This relieves the hydraulic pressure that might otherwise split timber when mating pieces are clamped together. 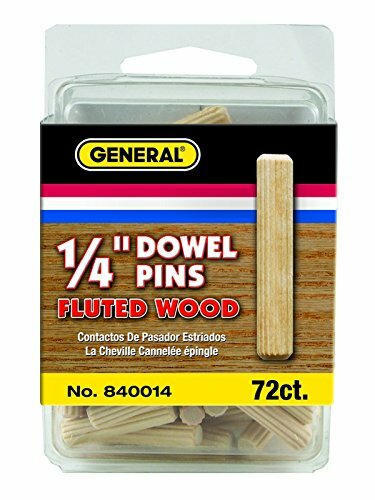 General's fluted dowels are ideal for creating strong and secure joins in furniture, cabinets, trim and special woodworking projects. Made of straight-grained solid hardwood. Expands when used with water-based glue for extra tight join. Fluted for easy insertion. As an FSC (Forest Stewardship Council), certified company, General's Wood Joining Program includes wood based products that are manufactured in accordance with FSC standards. The FSC is an independent, non-governmental, not-for-profit organization established to promote the responsible management of the world's forests and is nationally represented in more than 50 countries around the world. GENERAL TOOLS - THE PRECISE TOOL FOR DOING THE JOB EXACTLY RIGHT. Offering over 1,000 tools, we re proud to provide tradesmen, craftsmen and DIYers around the world with a broad range of affordable, specific-purpose mechanical hand tools and precision measuring and inspection tools. 1/2" x 2" Fluted Wooden 100 Pack. 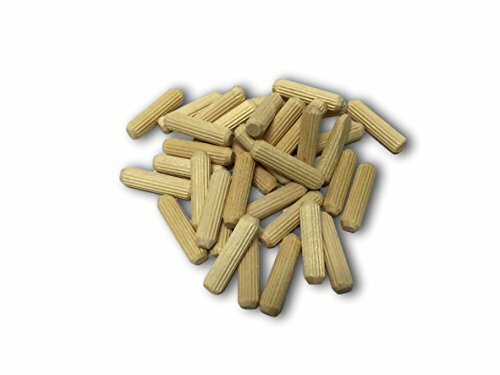 Wood Dowel Pins are Kiln Dried Birch Wood with Flutes which Eliminate Trapped Air for Superior Fastening. Fluted pins also ensure even glue distribution. Made of Natural Hardwood Harvested responsibly to meet FSC standards. Natural Birch wood, Non Food Safe. Beveled Chamfered ends are essential not only making aligning simpler, but crucial in ensuring completion of hand made man made projects. Allows margin of error and compensates if measurements are slightly off. Made of Hardwood This product comes in a clear plastic ziplock sealed bag which eliminates moisture for easy storage and accessibility. DIY practical applications: furniture refurbishing or repairs , shelving, shelf replacement, cabinetry for repurposing cabinets, up-cycling, maintaining chairs, repairs etc... Some arts and crafts applications include: class room projects, party crafts, camp crafts, model building, doll house miniatures, for teachers, students and camp instructors Some education applications: academic tools, teachers supplies for grade school, pre-k pre-school, kindergarten to elementary, middle school to high school. math tools for counting cognitive learning. A great American product. 100% Money back guarantee if you're not completely satisfied. FIRST CLASS MATERIAL Excellent product quality. They are uniform and strong, cut straightly from hard wood. We select quality wood, high density, so they are not easy to break. Cylinder in shape and they have beveled ends tapered for easier insertion. They are stable and can be removed and reused. They can be used as strong, secure joints between two boards. Easy job, don't sweat for a little bit when doing some repair work. VARIOUS SIZES FOR YOUR CHOICE They are consistent in diameter with a nice snug fit. They could be used on surface, edge or corner as joints. 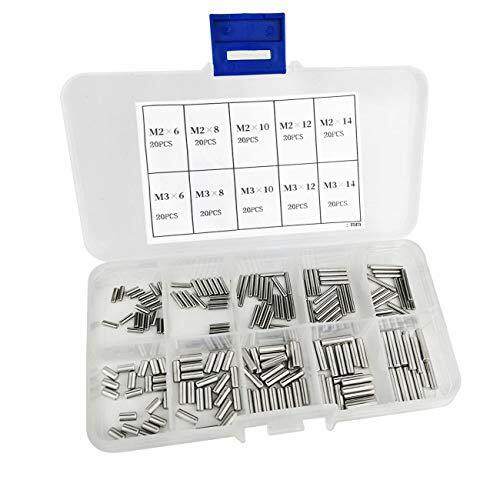 WIDE RANGE APPLICATION Use them for furniture, cabinet, drawer repairs, shelf replacement, fixing door hinges, chairs etc. Or some class room projects, party, camping, model building, building miniatures pet house. Also, we could use them as academic tools, teachers supplies; math tools for counting cognitive learning for children. NICELY-PACKED PACKAGE A pack of 400 would put in big polybag. 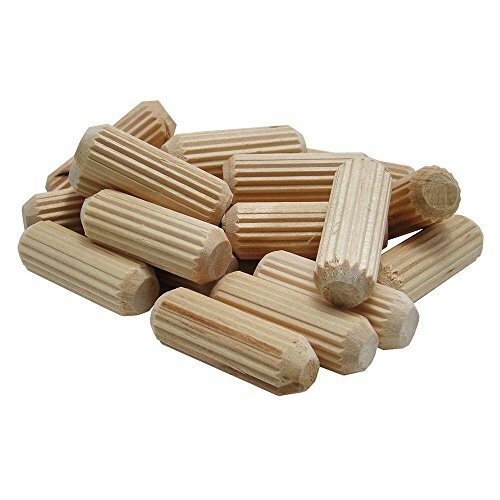 Each size of wood dowel pins would be put in a separate plastic bag respectively to avoid scratches during shipping. We must ensure it comes to you in good condition. 1/4" x 2" Fluted Wooden 100 Pack. 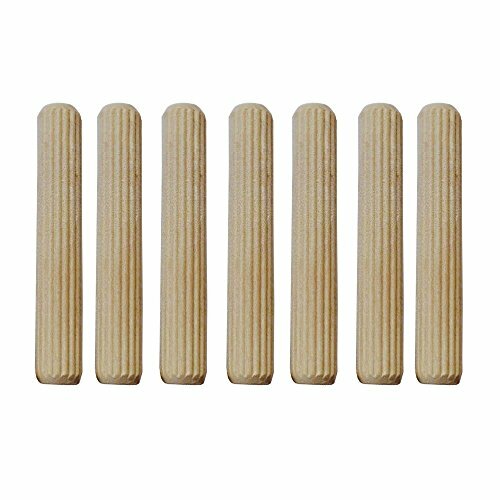 Wood Dowel Pins are Kiln Dried Birch Wood with Flutes which Eliminate Trapped Air for Superior Fastening. Fluted pins also ensure even glue distribution. Made of Natural Hardwood Harvested responsibly to meet FSC standards. Natural Birch wood, Non Food Safe. Beveled Chamfered ends are essential not only making aligning simpler, but crucial in ensuring completion of hand made man made projects. Allows margin of error and compensates if measurements are slightly off. Made of Hardwood This product comes in a clear plastic ziplock sealed bag which eliminates moisture for easy storage and accessibility. DIY practical applications: furniture refurbishing or repairs , shelving, shelf replacement, cabinetry for repurposing cabinets, up-cycling, maintaining chairs, repairs etc... Some arts and crafts applications include: class room projects, party crafts, camp crafts, model building, doll house miniatures, for teachers, students and camp instructors Some education applications: academic tools, teachers supplies for grade school, pre-k pre-school, kindergarten to elementary, middle school to high school. math tools for counting cognitive learning. A great American product. 100% Money back guarantee if you're not completely satisfied. 3/8" x 2" Fluted Wooden 100 Pack. 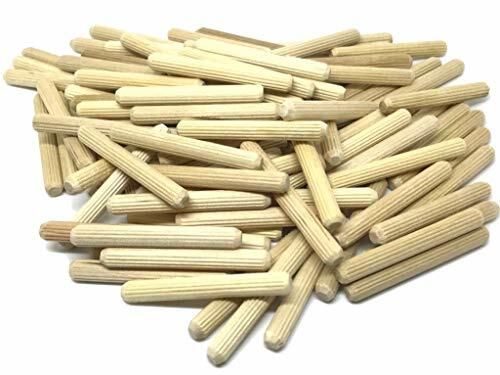 Wood Dowel Pins are Kiln Dried Birch Wood with Flutes which Eliminate Trapped Air for Superior Fastening. Fluted pins also ensure even glue distribution. Made of Natural Hardwood Harvested responsibly to meet FSC standards. Natural Birch wood, Non Food Safe. Beveled Chamfered ends are essential not only making aligning simpler, but crucial in ensuring completion of hand made man made projects. Allows margin of error and compensates if measurements are slightly off. Made of Hardwood This product comes in a clear plastic ziplock sealed bag which eliminates moisture for easy storage and accessibility. DIY practical applications: furniture refurbishing or repairs , shelving, shelf replacement, cabinetry for repurposing cabinets, up-cycling, maintaining chairs, repairs etc... Some arts and crafts applications include: class room projects, party crafts, camp crafts, model building, doll house miniatures, for teachers, students and camp instructors Some education applications: academic tools, teachers supplies for grade school, pre-k pre-school, kindergarten to elementary, middle school to high school. math tools for counting cognitive learning. A great American product. 100% Money back guarantee if you're not completely satisfied. Used to precisely align joints, hinges and fixtures. PRECISION MADE: Made to exact standards (+/- 0.0008") to guarantee perfect fit the appropriate hole size. HIGH CARBON STEEL: Heat treated high carbon alloy steel provides the hardest, strongest pin to withstand years of use. CHAMFERED ENDS: Rounded and chamfered ends for smooth and easy insertion into holes. OIL COATING: Helps aid insertion into hole while providing protection against corrosion/oxidation. MULTIPURPOSE: Precision made to be used in home projects or commercial applications. 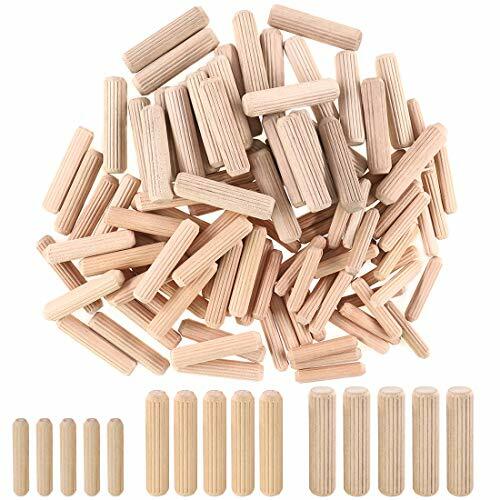 Wooden Dowel Pin Sets, made of straight grained hardwoods, compressed fluted design ensures even glue distribution and tight fit. Ideal for furniture, cabinets, trim and special projects, for edge to edge, edge to surface and edge to corner joints. Fluted Sides Fluted sides allow for even glue distribution while allowing any trapped air/glue to exit the hole. Beveled Ends Having a slight taper at each end doesn't just make alignment easier, in cases where there are multiple dowels in use (where it's likely that you could be a bit off with some of the holes) it's an absolute must! E-Z Storage Forget poly bags or those impossible to open clamshells! Our dowels come in a handy Plastic Bottle for easy storage of any extras. This item is not for IVAR CORNER SHELF. Made of hardwood from the USA. Kiln dried birch wood with flutes to eliminate trapped air for superior fastening. The fluted pins also ensure even glue distribution. Beveled chamfered ends are essential for making alignment simpler. This allows margin of error and compensates if measurements are slightly off. 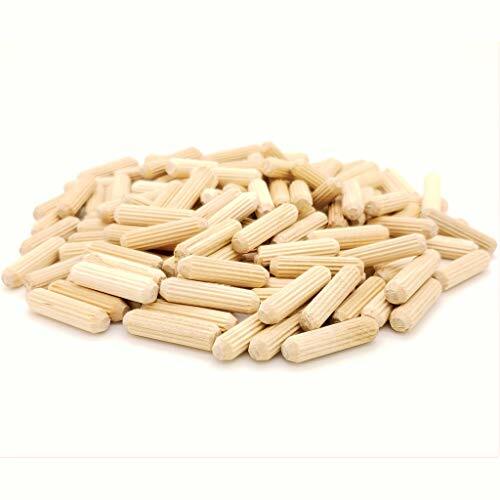 Package included 100 quality wooden dowel pins. DIY practical applications include furniture refurbishing or repairs , shelving, shelf replacement, cabinetry for re-purposing cabinets, chairs etc. Arts and crafts applications include class room projects, party, camping, model building, doll house miniatures, teachers, students and instructors. Educational applications: academic tools, teachers supplies; math tools for counting cognitive learning. 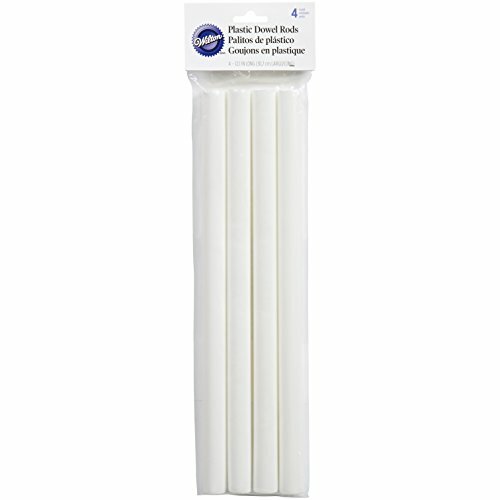 Cake Dec plastic rods 4pk. Produced with the highest grade materials. Material: plastic. Manufactured in Taiwan. Length: 12-3/4 inch. Diameter-3/4 inch. 1/4" x 1 1/8" wooden dowel pins made right here in the U.S.A. These have so many uses and will come in handy for you DIY projects, repurposing , refurbishing, up-cycling, crafts or just flat out maintaining. This product comes in a resealable plastic bag for easy storage and accessibility. A great American product. 100% Money back guarantee if you're not completely satisfied. Made in the U.S.A!! Superior Quality. Calibrated beech wood dowels made for constructing strong wood joints. 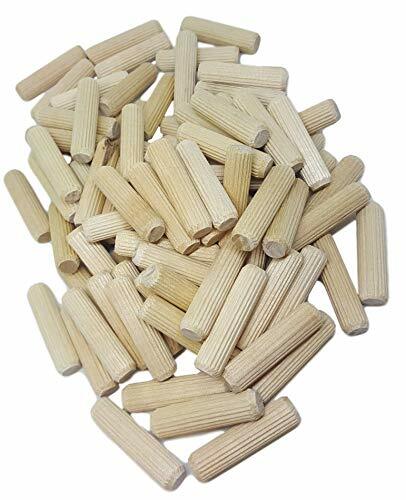 Manufactured from hard wood, which makes a durable and lasting dowel pin. Fluted shanks eliminate trapped air and provide good glue distribution. Fluted shank provides excellent glue distribution. For constructing strong wood joints in your furniture. 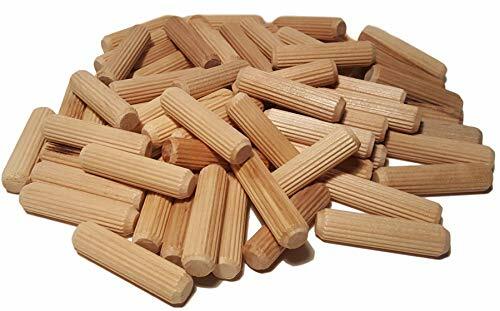 The wooden dowels are made from natural beech wood trees. This kind of wood is used in most furniture we see today since it is preferred by many carpenters and woodworkers. 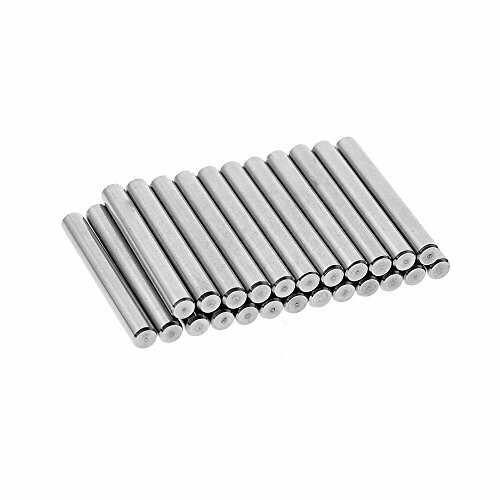 Made of 304 stainless steel, resistant to corrosion and rust. The two sizes (M2, M3) each have 5 different lengths. 10 sizes each of 20pcs. The locating in has a smooth surface and chamfered edges. Widely used in machinery, industry, furniture installation, etc.